I loved Moneyball, both the book, by Michael Lewis, and movie starring Brad Pitt, because they bring together two things I love: baseball and numbers. At the risk of shortchanging the book, the central story in the book is a simple one. For most of baseball’s hundred plus years of existence, insiders (baseball managers, scouts and experts) have used stories and narratives to keep themselves above the riff raff (which is where you and I as fans belong). Thus, scouts claimed to have special skills (based on their long history of having done this before) to find potential superstars in high schools and the minor leagues, and managers justified their personnel decisions and game day choices with gut feeling and baseball instincts. Billy Beane, the general manager of the Oakland As, a storied but budget-constrained franchise, upended the game by shunting hoary tradition and putting his faith in the numbers. My sample includes all (a) publicly traded firms, (b) listed on any global exchange and (c) have data on the data sources that I use (Value Line for US companies, Capital IQ and Bloomberg for non-US companies). In January 2012, there were 41,803 companies in my overall dataset. a. Risk measures and hurdle rates: Betas and standard deviations, as well as costs of equity and capital, by sector. b. Profitability measures: Profit margins (net and operating), tax rates and returns on equity and capital. d. Financial leverage (debt) measures: Book value and market value debt to equity and debt to capital ratios. e. Dividend policy measures: Dividend yields and payout ratios, as well as cash statistics (cash as a percent of firm value). f. Equity multiples: Price earnings ratios (current, trailing, forward), PEG ratios, Price to Book ratios and Price to Sales ratios. g. Enterprise value multiples: Enterprise value to EBIT, EBITDA, revenues and invested capital. I generally stay away from macro economic data but I do report equity risk premiums (historical and implied) over time and marginal tax rates across countries. 1. Data yields estimates, not facts: In these days of easy data access and superb tools for analysis, it is easy to be lulled into believing that you are looking at facts, when you are really looking at estimates (and very noisy ones at that). Every number that is on my site, from the historical equity risk premium to the average PE ratio for chemical companies is an estimate (and adding more decimal points to my numbers will not make them more precise). 2. Data has to be measured: That is again stating the obvious, but implicit in this statement are two points. The first is that someone (an accountant, a data service, me) is doing the measurement and imposing his or her judgment on the measured value. The second is that there can be error in measurement. Thus, with my data, you can be assured that there are errors and mistakes in the final numbers. While I can blame some of these mistakes on the data services that I get my raw data from, many are mine. So, if you find a mistake or even something that looks like a mistake, please let me know and I promise you two things. First, I will not be defensive about it and will take a look at the issue you have raised. Second, if I do find myself in error, I will fix the error as soon as I can. (With a staff of one (me), this data service can get stretched sometimes… So, please have some patience). 3. Data for post-mortems versus data for predictions: As I see it, data can be used in two ways. The first is to generate post-mortems (about past performance) and the other is make forecasts for the future. Given my focus on corporate finance and valuation, I am more interested in the latter than the former. Thus, my data definitions are more attuned to forecasting than to after-the-fact analysis. Just to provide an example, the cost of capital that I am interested in computing for a company is the cost of capital that I can use for the next five years, not the one for the last three years. 4. Data anchoring: Whether we like it or not, our instinct when confronted with a number, and asked to decide whether it is high or low, is to compare it what we consider reasonable numbers (at least in our minds). Thus, if I came to you with a stock with a PE of 10, your determination of whether the stock is cheap or expensive will depend largely on what you think the average PE is across all stocks and what comprises a high or low PE and all too often, in the absence of updated and comprehensive data, these are guesses. It is for this reason that analysts and investors create rules of thumb: a EV/EBITDA of less than six is cheap, a PEG ratio less than one is cheap or a stock that trades at less than book value is cheap. But who comes up with these rules of thumb? And do they work? The only way to answer these questions is to look at the data across all companies and make your own judgments. There is one final point generally about data that I have to make, and it relates back to Moneyball. Much as I agree with Billy Beane on the importance of data, I think that his mistake was focusing far too much on the data. The data should be the starting point for your assessments, but not the ending point. Stories do matter, if they can be backed up by the data, or to draw implications from it. The secret to great investing is a happy marriage between plausible investment stories and numbers, with the recognition that even the best sounding stories have to be abandoned at some point, if the numbers don’t back them up. So, explore the data and make it your own!! For hundreds of years, we (as consumers) have had no choice. Universities have operated with little competition and substantial collusion. There is no other way that you can explain how little variation there is in tuition fees across US universities and the rise in these fees over time. Outside the US, the fees may be subsidized by governments, but the quality of the learning experience is often worse, with the rationale being that if you paid little or nothing for your education, you should eat whatever crumbs fall of the table in you direction. But I think that the game is changing, as technology increasingly undercuts the barriers to entry to this business. I am not just talking about online universities (which, for the most part, have gone for the low hanging fruit) or the experiments in online learning from MIT, Stanford and other universities. These are evolutionary changes that build on the university system and don't challenge it. I am talking about a whole group of young companies that have made their presence felt by offering new tools for delivering class content and learning. I am convinced that the education market is going to be upended in the next decade and that the new model is going to do to universities what Amazon has done to brick and mortar retailers. To back up my point, I am running an experiment this semester with the classes that I am teaching at the Stern School of Business: Corporate Finance, a first-year MBA class, and Valuation, an elective. I have taught these classes for more than 25 years now and have tried to make the material and the lectures available to the rest of the world, but I have never formally tracked those taking these classes online. In fact, if you were not an MBA student in the class, taking the class online would have required you to forage through my website for materials and keep track of what's going on. And I would have no idea that you even were taking the class... So, I want to change that..
Last semester, I used a company called Coursekit to package and organize my class and was impressed with their clean look and responsiveness to my requests. This semester, which starts in a few days, I have created a coursekit page for each class that is focused on just online students. I will use this page to deliver content (lecture notes, handouts and assignments that those who are in my physical class get), webcasts of lectures (though not in real time, but the links should show up about an hour after the actual class ends ) and even the exams (you can take them and grade them yourself). The site also has a social media component, where you can start or join discussion topics, which I hope will provide the element of interaction that is missing when you do an online course. When you do get to the home page for Coursekit, you will notice my mugshot in the entry way. I promise you that I have zero financial interest in the company but I really want to see it succeed, because I think the education business needs to be shaken up. What is it? This is my "big picture" class about how financial principles govern how a business should be run. It looks at everything that a business does, through the lens of finance, and classifies them into investment, financing and dividend decisions. Just to be clear, my first obligation is to the students in my MBA classes and I will not stint or compromise on that obligation, but I view delivering a great learning experience to those taking the class online as a close second. Note also that you will not get any credit from NYU for taking this class. While I will give you the grading templates to grade your own exams and evaluate your own assignments, I will not be able to give you direct feedback on your work. But then again, the price (at zero) is set right. So, these classes definitely come with a money back guarantee. In fact, the more the merrier... So, pass the message in this post on to any friends who may be interested. See you in cyber space on Monday. Snowmen and Shovels: Investing Lessons? I live near New York and woke up this morning to our first snowstorm of the winter (we had a freak one in the fall but no snow in November and December). As I looked out of my window, I heard two sounds. The first was of small children squealing in delight, as they tromped through the snow and started building snowmen and throwing snowballs. The second was the grating sound of snow shovels being used by their (mostly morose) parents to clear the snow from their driveways. Three things came to mind. The first was the oddity of the same phenomenon (a snow storm) evoking such different reactions from two different groups. The other was the irony that the parents were one day (long ago in the past) happy to see the snow and today's happy children will one day grow up and be wielding their own snow shovels. The third is that a week from now when it warms up, the snowmen will melt away, and the unshoveled driveways will look just as good as the shoveled ones. I am sure that there are some deep life lessons in this phenomenon but I am not a philosopher. I do see some investing and valuation lessons in snowmen and shovels. After all, you can divide the world of active investors into two broad camps: growth investors and value investors. Consider the extremes in each camp. Extreme growth investors (you know the ones.. they go for momentum, love IPOs and are dazzled by high growth) remind me of the happy children, looking at snow and seeing snowmen, whereas extreme value investors (and you also know these ones.. they love net net investing and read Ben Graham's Security Analysis for inspiration) more closely resemble the snow-shoveling parents. Each group views the other with disdain. Extreme value investors consider growth investors to be dilettantes, unserious and unwilling to grow up, who see the world through rose-colored lens. Extreme growth investors view value investors as boring, stuck-in-the-mud pessimists, who see only the dark side of things. So, which side is right? I think both sides are right and both are wrong. While each side sees a portion of reality, each side is also missing a piece of the real world. While the value investing group is right in its view that most growth companies will not make it through the challenges of the real world, the growth investing group is also right in its view that some of these growth companies will be the big winners of the future. By staying dogmatic, both groups open themselves to significant investing/valuation mistakes. A growth investor who closes his eyes to the very real likelihood that a growth company will not survive will over value that company. By the same token, a value investor who insists on incorporating only the worst case scenarios, estimates cash flows “conservatively” and then applies a huge “margin of safety” before investing will never find growth companies to be bargains. The key to investing, as in so much in life, is to maintain balance, recognizing that dreams sometimes come true, while keeping your feet grounded in reality. Put in valuation terms, the key to valuing a company well is to estimate what will happen (to earnings and cash flows) not only in good scenarios (let’s call these the snowman scenarios) but also in bad ones (the shovel scenarios). It is a challenge I face whenever I do valuation. As I value a company, I have to constantly stop and look at the assumptions I am making and whether I am tilting too much to one side (snowman or shovel). If I find myself tipping too much into the “snowman” camp, I have to bring in some of my “shovel” side to play to get back to synch. If, on the other hand, I am letting my pessimistic shovel side dominate, I have to consciously force my fun snowman side come into play. So, here is how I am going to start today’s path back to balance. I shoveled this morning, just before I came in and wrote this post. My kids are too “old” to enjoy building snowmen, but I am not. I am going to go out and build a snowman, make a snow angel and perhaps throw some snowballs. Why should those kids have all the fun? Private Equity: Hero or Villain? The battle for the Republican presidential nomination seems to have claimed another "financial markets" casualty, at least in public opinion. In the last few weeks, we have seen Mitt Romney, who made his fortune at Bain Consulting, attacked for being a heartless, job-destroying private equity investor. I prefer not to enter political debates, but some of the critiques of private equity are so misdirected and over the top that I have to believe that these critics have no sense of what private equity is, the companies that they target and what they do at these companies. Equity: At the risk of stating the obvious, to be a private equity investor, you have to be an investor in equity, either in publicly traded companies (as stock) or in private business (as owners' equity). So any criticism of private equity that segues into mortgage backed securities, which are generally debt, or into overreach at investment banks prior to 2008 is mixing up its villains. Activist: A second feature of that separates private equity investors from most other equity investors is that they are activist, rather than passive investors. Thus, you and I, as passive investors, may buy stock in a company, believing it to be under valued or sub optimally managed, and then sit back and hope that the price moves up. An activist investor would buy stock in the same company and put in motion actions aimed at changing the way the company is managed (shutting down bad businesses, take on more debt, pay more dividends) or in fixing the reasons for under valuation (spin off, split offs, divestitures). Private: While activist equity investors have been around as long as markets have been around, there is a third aspect to private equity investing that sets it apart. Private equity investors preserve the option (though they don't always use it) of "taking private" some of their targeted publicly traded companies. In effect, they remove these companies from the public space, run them as private companies for a period of time (during which they make changes), and then either go public again or sell them to other public companies. With this definition in place, you still see diversity within this group. Broadly speaking, private equity investors can be classified into three categories: lone wolves (like Carl Icahn, Nelson Peltz and Bill Ackman), institutional activists (mutual funds and pension funds that trace their lineage back to the Calpers fund in the 1980s and are activist on the side) and activist hedge funds (which is where I would put Romney's Bain fund, KKR and Blackstone). What types of companies do private equity investors target? If activist investors hope to generate their returns from changing the way companies are run, they should target poorly managed companies for their campaigns. Institutional and individual activists do seem to follow the script, targeting companies that are less profitable and have delivered lower returns than their peer group. Hedge fund actvists seem to focus their attention on a different group. A study of 888 campaigns mounted by activist hedge funds between 2001 and 2005 finds that the typical target companies are small to mid cap companies, have above average market liquidity, trade at low price to book value ratios, are profitable with solid cash flows and pay their CEOs more than other companies in their peer group. 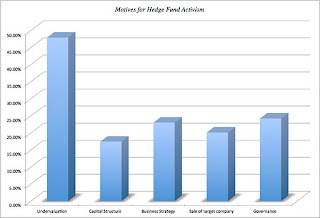 Another study of the motives of activist hedge funds uncovered that the primary motive is under valuation, as evidenced in the figure below. In summary, the typical activist hedge fund behaves more like a passive value investor, looking for under valued companies, than like an activist investor, looking for poorly managed companies. Activists individuals are more likely to target poorly managed companies and push for change. What do they do at (or to) these targeted companies? Two-thirds of activist investors quit before making formal demands of the target. The failure rate in activist investing is very high. Among those activist investors who persist, less than 20% request a board seat, about 10% threaten a proxy fight and only 7% carry through on that threat. Activists who push through and make demands of managers are most successful (success rate in percent next to each action) when they demand the taking private of a target (41%), the sale of a target (32%), restructuring of inefficient operations (35%) or additional disclosure (36%). They are least successful when they ask for higher dividends/buybacks (17%), removal of the CEO (19%) or executive compensation changes (15%). Overall, activists succeed about 29% of the time in their demands of management. A review paper of hedge fund activist investing finds that the median holding for an activist hedge fund is 6.3% and even at the 75th percentile, the holding is about 15%. Put differently, most activist hedge funds try to change management practices with well below a majority holding in the company. The same paper also documents an average holding period of about 2 years for an activist investment, though the median is much lower (about 250 days). Asset deployment and aperating performance: There is mixed evidence on this count, depending upon the type of activist investor group looked at and the time period. Divestitures of assets do pick up after activism, albeit not dramatically, for targeted firms. There is evidence that firms targeted by individual activists do see an improvement in return on capital and other profitability measures, relative to their peer groups, whereas firms targeted by hedge fund activists don’t see a similar jump in profitability measures. Capital Structure: On financial leverage, there is a moderate increase of about 10% in debt ratios at firms that are targeted by activist hedge funds but the increase is not dramatics or statistically significant. There are dramatic increases in financial leverage at a small subset of firms that are targets of activism, but the conventional wisdom that activist investors go overboard in their use of debt is not borne out in the overall sample. One study does note a troubling phenomenon, at least for bond holders in targeted firms, with bond prices dropping about 3-5% in the years after firms are targeted by activists, with a higher likelihood of bond rating downgrades. Dividend policy: The firms that are targeted by activists generally increase their dividends and return more cash to stockholders, with the cash returned as a percentage of earnings increasing by about 10% to 20%. Corporate governance: The biggest effect is on corporate governance. The likelihood of CEO turnover jumps at firms that have been targeted by activists, increasing 5.5% over the year prior to the activism. In addition, CEO compensation decreases in the targeted firms in the years after the activism, with pay tied more closely to performance. 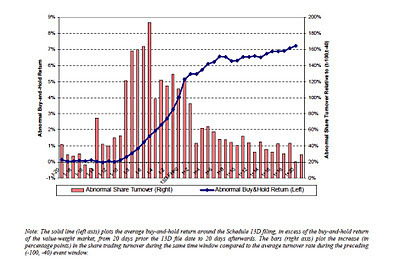 Do private equity investors make high returns? The overall evidence on whether activist investors make money is mixed and varies depending upon which group of activist investors are studied and how returns are measured. Activist mutual funds seem to have had the lowest payoff to their activism, with little change accruing to the corporate governance, performance or stock prices of targeted firms. Markets seem to recognize this, with studies that have examined proxy fights finding that there is little or no stock price reaction to proxy proposals by activist institutional investors. Activist hedge funds, on the other hand, seem to earn substantial excess returns, ranging from 7-8% on an annualized basis at the low end to 20% or more at the high end. Individual activists seem to fall somewhere in the middle, earning higher returns than institutions but lower returns than hedge funds. 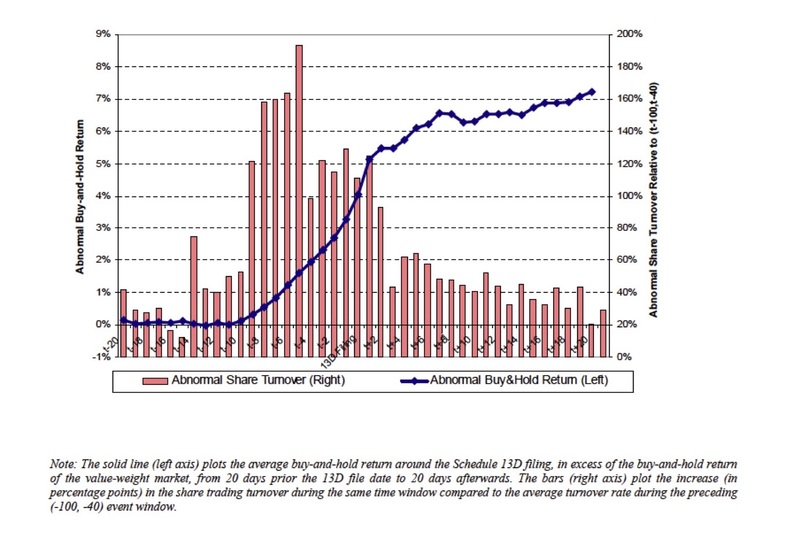 While the average excess returns earned by hedge funds and individual activists is positive, there is substantial volatility in these returns and the magnitude of the excess return is sensitive to the benchmark used and the risk adjustment process. Put in less abstract terms, activist investors frequently suffer setbacks in their campaigns and the payoff is neither guaranteed nor predictable. Targeting the right firms, acquiring stock in these companies, demanding board representation and conducting proxy contests are all expensive and the returns made across the targered firms have to exceed the costs of activism. While none of the studies that we have reference hitherto factored these costs, one study that did concluded that the cost of an activist campaign at an average firm was $10.71 million and that the net return to activist investing, if these costs are considered, shrink towards zero. The average returns across activist investors obscures a key component, which is that the distribution is skewed with the most positive returns being delivered by the activist investors in the top quartile; the median activist investor may very well just break even, especially after accounting for the cost of activism. Is private equity good or bad for the markets? How about for the economy? And for society? For some of you, this entire post may be missing the point of the criticism, which is that private equity investors are job killers, not job creators. To me, that criticism is misplaced, because you cannot measure the success of a business by the jobs it creates or saves, but by the value it creates for its stockholders, by making money, and for its customers, by providing a needed product or service to customers. In the process, if it is successful, it will hire people and create jobs. In fact, today's New York Times carries a story about one of the companies targeted by Bain in its Romney days, where 150 people lost their jobs, and it specifies that the company primary products was photo albums. Thus, while it is easy to blame Bain for the layoffs, the real reasons lay in a shifting market, where digital photography and computerized albums were replacing conventional photographs. The story's bigger point is that the people in the town have moved on, found other businesses to work for and are frankly surprised by the attention. If private equity investors are primarily interested in slimming down companies and creating value for stockholders, do they create value for society? I believe that they do, and for two reasons. First, they are the battering rams that we use as passive investors to initiate and create change at public companies, and especially at companies that need to change. Second, even when private equity investors target companies, force them to divest assets, slim down and pay out the cash to stockholders, the cash does not disappear into thin air. The stockholders who receive the cash use it to pay for products and services (which creates jobs) and to invest in other companies with better growth prospects (which in turn hire more people). In fact, my response to those who have a problem with private equity would be to ask the following question: Which aspect of private equity investing do you want to ban? Assuming that it is not equity investing collectively, it has to be either the activism or the "taking private" components. And what would that accomplish? Banning these practices would leave incumbent managers ensconced at publicly traded companies, unchallenged and unwilling to make changes, and the only jobs saved will be theirs. Bottom line: If you don't like Mitt Romney, don't vote for him. Find a good reason, though! The fact that he worked at a private equity firm, and was good at his job, should not be that reason. In fact, since the US government looks more and more like a badly managed enterprise in need a major restructuring, a "good private equity investor" in charge may be just what the doctor ordered.